As with any aspect of life, your choice of color for the car you drive can give insights about your personality and preferences. Most Americans spend a lot of time in their cars and either overtly or subconsciously use it as a means of self-expression. Whether you intend it or not, color choice says something about you, especially with something that you use nearly every day like your car. Silver has been a very prevalent car color in recent times. While this might be in part because silver looks sleek but not too overstated, it may also be a reflection of the technological advances our society has made. Many high tech devices are silver or metallic, and driving a silver car may indicate an alliance with and appreciation for this change and evolution in our society. A silver car may also indicate that the driver is practical and responsible, yet enjoys and appreciates the innovative and slightly flashy things in life. Gray, which is a variation of silver, often indicates personality tendencies of not wanting to stand out or be too flashy. While silver gleams and reflects a technology-minded individual who appreciates innovation and modern conveniences, the driver of a gray car is probably more low-key, seeing their car as mainly functional. Black is an extremely popular car color as well, and is especially prevalent in luxury model cars. A deep black shiny car exudes a feeling of luxury and the finer things in life, especially if the car is a newer model. Black is sophisticated, powerful and always makes a statement. It is the color of the cars that transport presidents and diplomats, and it always makes a striking impression. Choosing this car color indicates that you wish to exude these qualities yourself. White is a less common choice these days for car color but it also expresses elegance and the desire to set oneself apart. In newer, more expensive cars, it can even have an air of opulence. In any car, it brings a contemporary feel that shows taste, style and the desire to stand out in a classy way. The color white is also traditionally connected with purity, honesty and rebirth. While more neutral car tones like silver, gray and black have been very popular in recent years, red is still a favorite among a certain group as well. Drivers of red cars definitely want attention, and it’s hard not to notice a bright red car no matter what the make or model. Red can also indicate energy, ambition, power and confidence – or a desire to be seen as having these qualities. Blue is a practical, positive and upbeat color and often reflects that the driver might have these qualities. Medium to bright blue can indicate that the driver is down to earth and reliable, while slate blue exudes more formality and professionalism. By contrast, lighter shades of blue can convey the desire to be low-key and a bit more in the background. Earth tones like brown, beige, tan and green have risen in popularity in recent years, especially with the surge of SUVs and sporty cars that are ideal for hitting country highways or mountain roads. These colors often indicate a grounded individual who appreciates nature and respects the environment. Your car is something you use nearly every day, and the color you choose likely indicates aspects of your personality either overt or dormant. 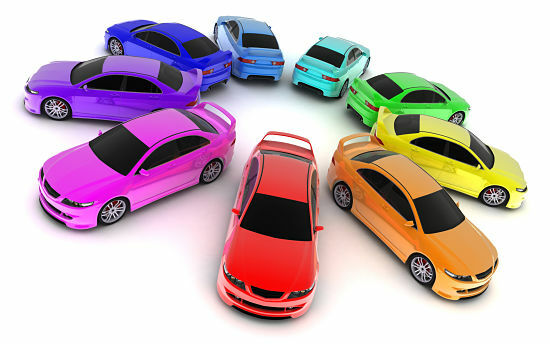 How accurate is your choice of car color to who you are or who you want to be? I am a senior citizen driver new to owning a car. Lived in NYC where public transit is the way to go. I want to make sure I am noticed driving, so red is the choice for me. Normally black or silver would be the choice, to match my clothing.